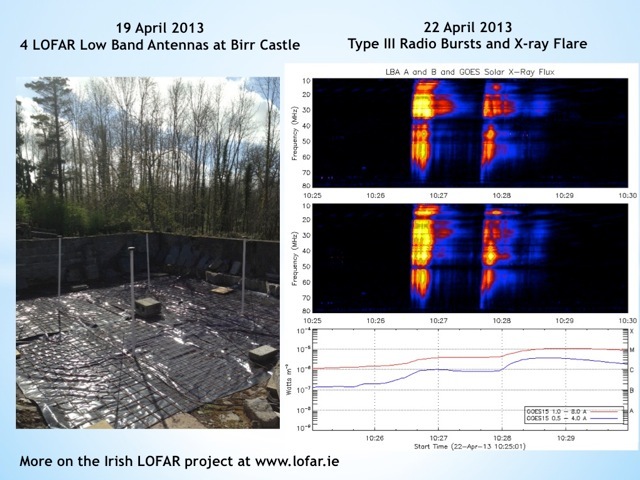 As we reported a few day ago, the Irish LOFAR (I-LOFAR) team have installed four refurbished LBA aerials at the Birr Castle site. The aerials themselves were installed on the 18th and 19th April 2013 and the system was connected up to two low-cost Callisto receivers and switched on. Then, on 22nd April, there was an M-class solar flare, which the Birr LOFAR test station picked up without any trouble at all. As you might imagine, the scientists there are thrilled with the result, and the KAIRA team are also delighted to see our colleagues make such rapid progress. Well done I-LOFAR! Let's hope now that, inspired by this result, Ireland can continue to invest in this productive and successful scientific endeavour.